After a long-fought six-year battle, independent cattle producers have finally succeeded in stopping the National Animal Identification System (NAIS), which was an onerous plan conceived by the World Trade Organization (WTO) and promoted by the U.S. Department of Agriculture (USDA), domestic and multinational ear tag companies, as well as multinational meat packers and their closely aligned trade associations. The battle was extremely lopsided. USDA had millions of dollars of taxpayer money — over $140 million to be precise — to develop and promote NAIS and to persuade state departments of agriculture and cattle industry trade associations to recruit as many independent cattle producers as possible into the ill-fated NAIS program. According to the Web site www.usaspending.gov, the National Cattlemen’s Foundation, part of the National Cattlemen’s Beef Association (NCBA), received over $2.1 million from the federal government in 2008 to promote NAIS. Armed with millions of dollars and six years worth of joint government and processing-industry planning, how did NAIS get stopped? The answer is that NAIS was stopped by the persistent, relentless pressure applied by a handful of non-conventional organizations that exclusively represented the interests of cattle farmers and ranchers, not the interests of the industrialized sectors of the U.S. beef supply chain. This was a David versus Goliath battle in which David won and the interests of independent cattle producers came out on top. These recent victories by independent cattle producers, with far less political clout and economic power than their conventional beef industry trade association counterparts, strongly suggests that there remains a genuine reason for hope that independent cattle producers can reverse the present course of their industry — a course that is fast leading toward more and more corporate control over the U.S. cattle industry by beef packers that are capturing control over the live cattle supply chain, just as they have already captured control over both the poultry and hog supply chains. The beef packers are now focusing their efforts on the feeding sector of the cattle industry by purchasing more and more feedlots (JBS recently purchased the nation’s largest feedlot company, Five Rivers Ranch Cattle Feeding, L.L.C.) and gaining increased control over the fed cattle market through the use of new cattle procurement tools, such as certain marketing agreements and formula-type contracts that effectively reduce the competitiveness of the fed cattle cash market. As with every major policy issue victory, the real work begins now. Now that NAIS has been scrapped, a new program needs to be developed to achieve improvements in the United States’ ability to quickly contain and control animal diseases. Independent cattle producers must remain directly involved in the development of this new program to ensure that it does not infringe upon their rights and privileges as did NAIS. It is encouraging that when Agriculture Secretary Vilsack announced he was going to pursue a new approach to animal disease traceability, he also announced that the U.S. must strengthen its import controls to prevent the introduction of animal diseases at our borders. This is a high priority for independent cattle producers who intrinsically understand that we cannot continue importing diseases like BSE, bovine tuberculosis and brucellosis if we desire to maintain our industry’s reputation of producing the healthiest cattle in the world — a reputation that is the U.S. cattle industry’s competitive advantage in both the domestic market and the global market. I encourage every cattle producer to take a new look at the relatively new organizations that have amassed uncanny successes for independent cattle producers despite seemingly impossible odds. Each of the organizations that brought us to where we’re at today is not likely to lead us in a new direction. But some of these new organizations will and they need your support to continue winning their fight to restore for the U.S. cattle industry the opportunity for U.S. cattle producers to maintain independent and profitable cattle-producing businesses all across the United States. The future of the U.S. cattle industry is in your hands and will be determined by which organization you choose to support. The NAIS that USDA was attempting to force down the throats of independent U.S. cattle producers, utilizing our own tax dollars, would have completely changed the way cattle farmers and ranchers do business. While obtaining a premises ID number — the first step to a nationwide NAIS — required no effort, the second and third steps in the onerous WTO-mandated system would have been costly, difficult, and, I believe, would have generated rebellion on the range. Reporting the movement of every animal, once it left its birth farm of origin, was a completely unworkable system for producers, especially those operating in our most populous cow states, where the average cowherd size is 30 to 40 mother cows. Imagine having to get your cattle in a chute, read the tags electronically, and report the numbers to USDA every time you moved a set of calves to another pasture, your Dad’s place, or sent a group of calves to the sale barn. Not only were you going to be required to read the tags electronically, but you were going to be required to report the tag numbers to the appropriate authorities within 48 hours of that movement, or you would be out of compliance and subject to enforcement fines: A range rebellion in the making, and completely unnecessary for a first world country like the United States. At least for the time-being, the government has listened to the people. A spike has been driven into the heart of a one-world government’s dictatorial rule. Maybe our Constitution is not dead? So, I have to wonder where is USDA in this story? Aren’t they on site inspecting this meat? Where are they? How many of their inspectors have been fired over this? How many Supervisors have been sent to Fairbanks Alaska for the Reindeer inspection program? Probably none! I see USDA as a major source of this problem. Issue #1: Why did it take an FSIS Food Safety Assessment to find the problem? Where were Huntington’s people? Do they need to bring in outside resources? Is every company in the U.S. that does grinding prepared for an immediate FSA? Issue #2: Assuming no weekend work, they recalled nine days worth of product. Whatever happened to batch production? Doing it right should mean a day’s worth pulled out of commerce, maximum. Issue #3: Test and hold (or as Ann Wells, Director of Scientific and Regulatory Affairs at the North American Meat Processors Association, corrected me months ago: “hold and test”) all of a sudden sounds like cheap business insurance. The answer to Issue #1 is an FSA will find the weak link in your business. If you’re not ready for it right now, get the help you need. Right now. WASHINGTON (CNN) — The nation’s largest beef recall got a whole lot larger Thursday, as Hudson Foods moved to take 25 million pounds of ground beef off the market at the behest of the U.S. Department of Agriculture. about 70 years ago, they destroyed or stole all food and animals, starving to death 7 million people. Today Zimbabwe, the bread basket of Africa, has had its farms destroyed and is on the verge of starvation. Is our country next? George Bush] are having great success creating a world dictatorship. Most of their power has been acquired from purchased government officials. Congress has, for example, depleted our industrial base by giving the unelected elitists at the United Nations World Trade Organization complete control of our trade decisions. 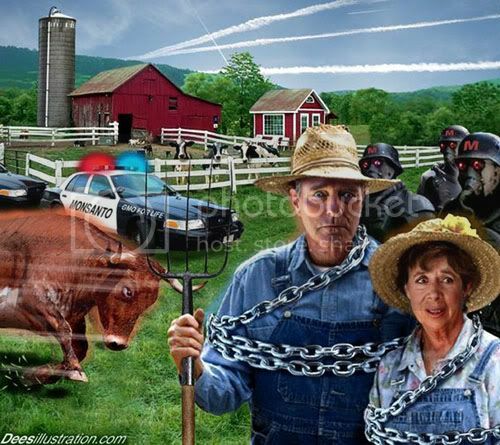 The coming National Animal Identification System (NAIS) is another prime example of this legislative road to enslavement [Assault on Small Farmers]. When in full force NAIS will assign all animals a land base (farm) and each animal will have a radio frequency identification tag. Every time a cow is sent off its land base to a sale, or a horse is ridden off its land base, government permission will be required. The global positioning in the tag will give Big Brother the ability to spy on you. I’m sure Stalin and Hitler would have been envious of such a system. Grant Hagan lives in St. Marys, Pennsylvania. His letter appeared in the Summer 2006 issue of Rural Heritage. NAIS wins award for USDA’s most dastardly idea. Note: NAIS has won the award for 2009’s most DASTARDLY USDA IDEA. In Ag Sec Vilsack’s listening sessions, designed to find some common ground of appreciation for the USDA brain child, the bribe-riddled NAIS found accumulations of increasing retch with each of 16 town hall style meetings. Livestock people increased dislike with each interpretive spin from USDA. Although the livestock press, USDA state veterinarians and USDA universities defend full-blown NAIS, livestock producers were not willing to relinquish their meager profits for the red tape of a new government enforcement program. When NAIS was not palatable federally, the USDA split the troops and provided over $150,000,000 in incentives for each state to take NAIS as a state enforcement project. When that costly idea slammed head-on to more resistance, in court and otherwise, now the USDA troops are dividing more. NAIS surveillance is becoming mandatory for certain disease studies. To try and forget the flawed thought of NAIS, new names are now being invented like “animal ID”, “information systems”, “food safety”, “animal health emergency management”, “animal security” and a host of other invented terms, just to sell the same old NAIS enforcement. 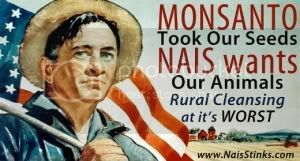 Beyond the millions spent to swallow NAIS, now many more millions are being spent to huddle government employees around new brain schemes to sugar-coat livestock surveillance enforcements. The article below is filled with costly processes that will be paid for by livestock owners and create more government jobs. “One Health: Implications for Animal Agriculture” is the theme of the 2010 Annual Meeting of the National Institute for Animal Agriculture (NIAA), March 15-17 in Kansas City, Mo. NIAA’s opening general session speakers will look at how the One Health initiative and strategies shift the focus from surveillance to intervention and prevention and how challenges need to be faced collectively rather than in individual silos and disciplines. The lineup of speakers will represent active members on the One Health Commission, representatives from the veterinary and human health community and representatives of animal agriculture. NIAA’s 11 species-based and issue-based committees–which are open to NIAA members and non-members–will meet on Tuesday afternoon, March 16, and Wednesday, March 17. Issue-based committee meetings include animal care, animal health emergency management, animal health and international trade, animal production food safety and security, emerging diseases, and animal identification and information systems. Species-based committees include cattle, swine, poultry, equine, and sheep and goat. Each committee meeting features its own line-up of nationally recognized speakers. “NIAA’s annual meeting is an ideal place for producers, animal health and management professionals, animal agriculture extension specialists and all of those involved in animal agriculture–cattle, swine, sheep, goats, poultry and equine–to gather and become better informed and involved regarding One Health,” Forshey adds. A schedule of events for NIAA’s 2010 annual meeting, meeting registration, list of NIAA committees and hotel information are available at the NIAA Web site. Individuals are also welcome to call NIAA at (719) 538-8843 for information. No sooner have most people pronounced NAIS dead-on-arrival, than a number of recent events may have breathed life back into the U.S.A.’s National Animal Identification Scheme. A combination of market forces aligned with a simplified tracking technology, and some rare positive news may have reinvigorated USDA’s moribund, voluntary animal traceability initiative. First the news headlines. Even though the U.S. House of Representatives had voted to cut off funding for the NAIS as part of the Farm Bill, a joint House-Senate conference committee agreed a few weeks ago to continue funding the program to the tune of $5.3 million for fiscal year 2010-2011. This funding is a reduction from the $14.2 million authorized for last year and less than the $14.6 million the Senate approved, but the program will continue. However, a growing number of Congressional members have made it clear they want to see effective leadership from USDA to dispel some of the more egregious NAIS rumors running unchallenged in the countryside (e.g., backyard farmers with only a few chickens for home use or sale to friends will have to tag and track each animal). They also want to expand the number of farms and ranches that have registered with the NAIS premises database from the current anemic 13% to closer to the 90% needed for an effective national system. The second piece of news for NAIS supporters is that U.S. District Judge Rosemary M. Collyer in Washington, D.C., dismissed a civil suit filed by the Farm-To-Consumer Legal Defense Fund and a group of Michigan cattlemen against the USDA and the Michigan Department of Agriculture (MDA) over the National Animal Identification System (NAIS). The group’s suit, filed last September, sought to enjoin the implementation and enforcement of NAIS. The suit was dismissed primarily because Judge Collyer ruled the program was voluntarily adopted by state departments of agriculture and was not federally mandated. Should NAIS become mandatory, sorry — the judge has already ruled. Even with a bit of good news, the large opposition anti-NAIS forces continue to rally their troops by claiming that NAIS is overly burdensome, and is unnecessary because existing livestock records, such as brands, ear tags, veterinary logs and auction barn records do a good and economical job of tracking cattle movements. Dr. George Teagarden, the Kansas state veterinarian, agrees that the current record-keeping system can be used “to find the animals in question, but it can be months after the fact.” According to Dr. Teagarden, this time lag isn’t nearly fast enough and he cautions, “A highly contagious animal disease will devastate this country.” He underscores this dire prediction by noting that in Kansas in a single month cattle from all 48 of the Continental U.S. states arrive at least once a month. The speed of commerce is too fast to be handled by the paper-based system.” Dr. Teagarden is also aware that history does not record any such “devastating” disease to affect Kansas since Foot & Mouth was eliminated in the late twenties. His pandemic prophecy is not a fear to the majority of livestock producers in Kansas or the nation, however those hovering inside the beltway still listen. Apparently, a number of national governments agree with Dr. Teagarden, and recently several have made or are poised to move their systems from voluntary to mandatory. Within the last few months these key countries have made major moves towards mandatory traceability; moves that are likely to impact USA policy and USA producers. It is important to understand the difference in other countries. Australia and Canada produce 60% more beef than their country consumes and absolutely must protect and increase export sales. Totally different, the US in 2008, according to the NASS, exported $2,876,906,000 in wholesale beef, but imported $4,764,392,000. For 21 years the US has not produced enough beef to feed the nation. The difference in the urgency to export US beef is drastic. If the US exports more beef, they, in turn must import that exact amount more to feed the nation. In that respect, the US is depending on imports and has no surplus for export at all. All beef export from the US is simply a trading process that does not profit producers, but only those directly related in the selling and buying. Brazil. Brazil, also producing much more than is being consumed, has just announced that by 2011 all livestock producers will be required to participate in a mandatory traceability system. 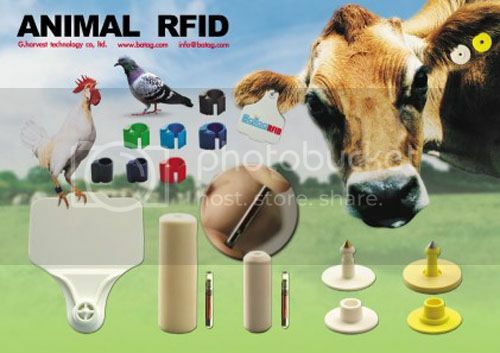 The new system will rely on simpler technology than the current, voluntary SISBOV system which is RFID-based, and every segment of the Brazilian supply chain, from cow-calf operator to slaughter facility including transporters will be required to provide a complete chain of custody records. Real-time electronic record-keeping is not being mandated, but standardized record-keeping whose data can be transmitted via Internet portals to centralized databases will be used. The SISBOV system will continue to exist for those who want to use it, but the expectation among Brazilian officials is that most producers will use the standardized, simplified paper-based system. On a world export basis, the countries with the most compliance costs will be the least competitive. Korea. South Korea has instituted a traceback system on domestically raised beef, and has indicated that it would require traceback on imported product by 2010. Japan. The Japanese government has had a domestic animal identification system in place for several years, and on three different occasions the then-minority political party, the Democratic Party of Japan, had unsuccessfully tried to pass legislation that would require the same level of traceability for imports. In August the DPJ successfully became the controlling party for the first time in a long period, and newly appointed Prime Minister Yukio Hatoyama has vowed to once again try to revise the Beef Traceability Law. He doesn’t have control of the Upper House of Parliament, but he may be able to persuade his two coalition partners to go along. How do these foreign government actions impact the U.S. meat industry? The Brazilian action probably has less direct impact on the US than do the Asian actions, because the Brazilian action was aimed at broadening acceptance of Brazilian beef in the EU. There will be some impact, though, because the largest of the Brazilian meat companies, JBS, is also one of the major U.S. meat producers so there will likely be some technology transfer from Brazilian ranches to their U.S. counterpart. A major key to Brazilian acceptance of a mandatory livestock traceability system by Brazilian legislators was the simplification of the system of initially registering an animal and then tracking its movements from birth to export. The predecessor voluntary system in Brazil known as SISBOV is an RFID-based identification system with real-time electronic data collection and transmittal. While effective, this system is technologically sophisticated and beyond both the economic means and technological understanding of a large percentage of Brazilian producers. Embracing and actively promoting a simplified registration and tracking system by USDA, we believe, will go a long way towards helping reduce opposition to NAIS. Even with all of these developments, make no mistake — NAIS is still on life support, and it may still die. But when the marketplace speaks and producers begin to learn the US is and has been a net import country, and no export markets are necessary at all, NAIS becomes even closer to true and lasting death!